The Alphabet that forms the basis of the Gertrude Garrow Reading System was devised by Gertrude (Linnane) Garrow, at her school in Dublin, Ireland, between 1975-79. Gertrude tells why she devised her alphabet. “One day in 1975, having failed, over a six-month period to get five-year old Alan to recognise one letter of the alphabet, I drew a head and tail on the letter ‘h’ and said “Darling, this is a horse.” I then drew legs on the letter ‘o’ for octopus and a head and tail on the ‘s’ for snake. The next morning, the little boy came to class, picked up the regular alphabet flash cards, spread them out on the table, selected the three letters, brought them to me and said,“ This is horse. This is octopus and this is snake”. I was astonished. Alan could identify the letters when they were part of pictures. As a result of this discovery, I created a picture-alphabet just to teach him. The letter-pictures were altered many times, for example: ‘c’ was a ‘cat’, ’cow’ and ‘caterpillar’ and ended up as ‘cup’ because the handle looked a bit like the letter ‘c’. Later, I decided to try to find a better way of teaching the letter names and sounds, so with the help of my sister Jane, I composed simple songs to accompany the picture-alphabet. The results from using this alphabet and songs were so dramatic that parents begged me to have the materials published. Consequently, in 1978, Jane and I had the songs recorded at the Communication Centre in Dublin, Ireland. 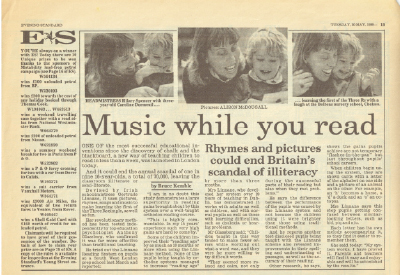 1978-83, We sent the alphabet, audiocassette and a basic phonics reading system to several Irish and UK publishers. These included Folens, Fallons and The Educational Company in Ireland and Oxford University Press, Blackwells and Hamlyn Templar in the UK. 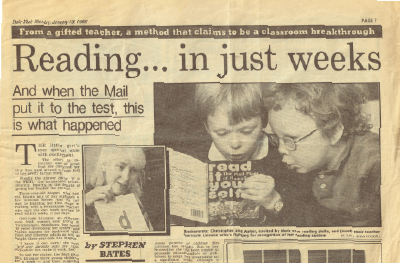 The system was not adopted at that time as the ‘Look and Say’ teaching method was just being introduced and phonics was no longer in vogue. 1984, Pathfinder Publications published the alphabet, songs and number systems using the titles of ‘Laugh-a-Letter’ and ‘Laugh–a-Number’. Encouraged by the results from the feedback from people using the alphabet, I combined the pictures to teach digraphs, trigraphs and letter clusters etc. Subsequently, I wrote stories and songs to explain why ‘sh’ made a ‘shh’ sound or ’ch’ sounded like a sneeze. 1989, Pic Toys Ltd, UK republished the alphabet and the songs together with some of the letter groupings, which now included ‘sh’ ‘th’ ‘ch’ and wh’.